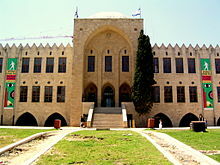 Other museums in Haifa include the Museum of Prehistory, the National Maritime Museum, the Hecht Museum, the Dagon Archaeological Museum, the Railway Museum, the Clandestine Immigration and Navy Museum, the Oil Industry Museum, and the Mane Katz Museum. The city's two main football clubs are Maccabi Haifa and Hapoel Haifa who both currently play in the Israeli Premier League and share the Kiryat Eliezer Stadium as their home pitch. Haifa has a professional basketball club, Maccabi Haifa. This page was last edited on 8 January 2012, at 10:40.